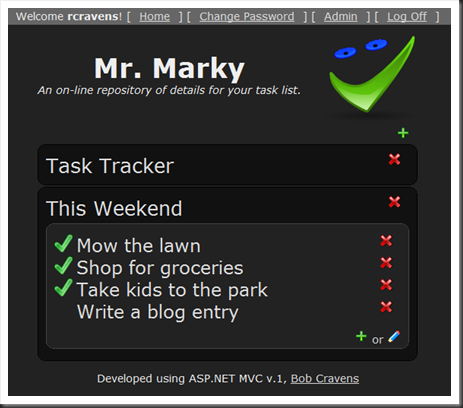 In this blog I will introduce an online task manager created using the ASP.NET MVC framework. Here is a demo site and screen shot. The purpose of the project is to explore more deeply the ASP.NET MVC framework while creating something that may be useful (at least to me). ‘Mr. 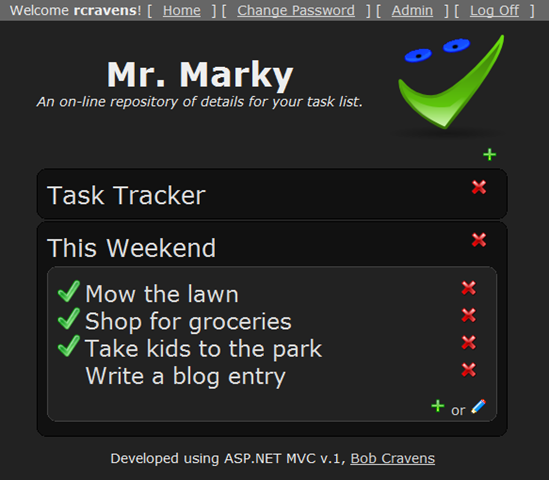 Marky’ is an online task management system. At this point, the feature set really only covers the basics. You can create a new task, add items to the task, and check them off when you are done. In addition, the site provides the membership authentication and registration. Both classes are decorated with the ‘Serializable’ attribute for the purpose of enabling the objects to be serialized (to XML) as a means of persistence. This is an architecture decision based upon the availability of databases provided by my hosting service (GoDaddy). A ‘Task’ object holds the information for a task. This task can have many ‘TaskItem’ objects. The ‘Task’ class also has a couple of constructors that are used to instantiate ‘Task’ objects. This interface simply defines the CRUD (create, retrieve, update, delete) and list all methods. Using an interface provides an easy way to mock the data source for testing purposes (this blog entry will not cover testing). The following is an implementation of the interface that persists data in XML format. // TODO: Log unable to open the file stream. // TODO: Log serialization exception. The constructor calls the ‘Initialize’ method that pulls the file location information from the Web.Config configuration file. Then the methods of the ‘IItemsRepository’ interface are implemented. The last bit of code handles the serialization / de-serialization of the data to the file. I have stubbed in exception handling and added comments where logging should be implemented. This model transforms the a ‘Task’ object into a format that is needed by the edit view (more later). The transformation is done by the constructor and the de-transformation by the ‘ConvertToTask’ method. Because this data will be edited by the user, this model implements the ‘IDataErrorInfo’ interface. This interface is used by the MVC model binding to provide server side validation on the data provided by the user. That’s it for the model. Let’s take a look at the views. This MVC application uses a master page to provide some common content. The following views provide content for the mater page. There is a ‘List’ view that presents a list of tasks for the user and an ‘Edit’ view that allows the user to edit the details of the task. The top portion of the mark-up defines a menu area. The remaining mark-up creates the definition list (‘dl’ element) containing the tasks. The definition title (‘dt’ element) is used to contain the title and a delete task method. The definition detail (‘dd’ element) is used to contain the items associated with each task. The following bit of jQuery is used to initially hide the ‘detail’ div (inside the ‘dd’ element) and later display it when the user clicks the anchor tag (inside the ‘dt’ element). The following jQuery allows all anchors that delete (either a task or an item) to provide a client-side confirmation before executing the action. And finally, the following jQuery hooks up the item anchors (inside the ‘ul’ / ‘li’ list) to an AJAX call that toggles the completion status of that item. There is a fair amount of CSS for this page. Please either download the project or use your favorite browser tool (Firebug in Firefox for instance) to finesse out these details. Here we leverage the MVC model binding (using the IDataErrorInfo interface) to provide feedback to the user of errors in the entry form. Note that this is server-side validation and the application should probably have some measure of clients-side validation. The following is the ‘TaskController’ for the above model and views. // TODO: Log a LINQ exception here. //    Otherwise, the 'ToggleIsComplete' ajax method handles the request. List – This action method serves up the ‘List’ view that we covered earlier. DeleteTask – This action method provides the functionality to delete a task (and all its items). Although this method requires authentication, it is still vulnerable to a CSRF attack and could use a bit more security. DeleteTaskItem – This action method allows the deletion of an item from the given task. ToggleIsComplete – This is an AJAX action method that toggles the status (complete or not complete) of the item. Edit (Get and Post) – These methods handle the HTTP GET and POST for the ‘Edit’ view. Note that the POST method once again leverages the model binding of the MVC framework. This application uses the ‘ActionController’ and the corresponding views that are generated with the new MVC project. However, because my web hosting provider limits the number of databases that I can have, I converted the membership provider to use an XML file instead of the SQL Server database. As a starting point, I used the provider created by Mads Kristensen. This code provides a drop in replacement for the SQL Server membership provider. Be sure to read the comments as they provide hints to a number of errors that need to be fixed. I have a few more ideas to help Mr. Marky become more useful. Using the ASP.NET MVC framework to create a website that has forms authentication was very easy. The MVC design pattern promotes separation in the presentation layer.